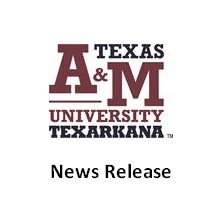 TEXARKANA, Texas – Texas A&M University-Texarkana and the Bowie County Master Gardeners will present a program on “Texarkana Water Utilities Composting” on Monday (Apr 8). The event will take place in Room 306 of the university’s Science and Technology building from 6:00 pm until 8:00 pm. The class is free and open to the public and reservations are not required. The Program’s Speaker will be David Waldroup from Texarkana Water Utilities. David is also a Miller County Master Gardener and will be discussing the co-composting operation at the South Regional Wastewater Treatment Plant. This composting process allows a considerable amount of material diverted from being landfilled while providing a very beneficial and usable end product that can return to the community. He will also be answering any questions you may have about Texarkana Water Utility compost and how it can be a great asset to your landscape. Here is just a reminder about the Farmers Bank & Trust Distinguished Speaker Series with Ben Stein. The event is at 7:00 pm in the Texarkana Arkansas Convention Center if you’re interested in covering it. There are also tickets for on sale in the TAMUT Business Office.